I initially learned about Satterthwait's Miss Lizzie from one of Nancy Pearl's Book Lust books. Pearl's recommendations are never to be ignored, and I'm happy to report that Miss Lizzie has become one of the best books I have ever read! 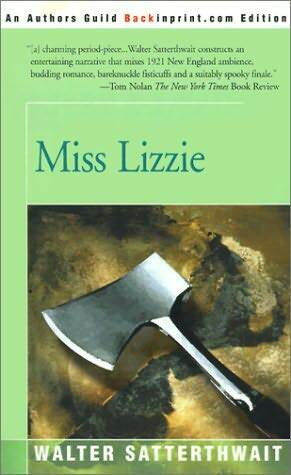 Miss Lizzie is a fictional look into the elderly life of the infamous ax-murderer Lizzie Borden. If you're not already familiar with Lizzie Borden and the crime of which she was accused, put this novel on hold until you've taken the time to learn more about her. This Lizzie Borden Wikipedia page is a great place to start. If you don't know the history about Lizzie Borden, much of this novel will be lost on you. Lizzie Borden has always been held in high regard as a genius, and Satterthwait's interpretation of Ms. Borden in this novel is closely aligned with that widespread belief. Lizzie's unresolved crime is still considered today to be one of the most complicated and intricate unsolved mysteries of all time. At the focal point of Miss Lizzie is a murder that involves a young teen named Amanda who lives next-door to Lizzie Borden. Amanda, who is fully aware of Ms. Borden's past, befriends the elderly woman, who provides her with some insight in regards to how to handle herself after the murder. Throughout this novel, I teetered on the edge of my seat waiting for Satterthwait to present new and unique fictional theories regarding Ms. Borden and the crime. Not only is this book a gripping page-turner because of the mystery within a mystery, but also because we hope that in time, Ms. Borden reveals herself to Amanda - and to us. I highly recommend Miss Lizzie, which has also influenced me to add other books by Walter Satterthwait to my reading radar. Other books by this author include Wall of Glass, Escapade, Cavalcade, and At Ease with the Dead. Have you read Miss Lizzie, and if so, what did you think? Share your comments with us below.